« Why can’t I pull up my boat at Kakadu Beach? You think you know what it is – but what is it? Walking along the beach at Bribie (any of them – Bribie has lots of beautiful beaches!) – there, among the shells and seaweed, the pumicestone and cuttlebone, is something…..what is it? … a jellyfish ? … a piece of broken jellyfish?.. No, that’s the egg mass of the leaden sand snail – Wow, look, there are lots of them! The leaden sand snail is as common as mud –which is just where you’ll find it – on the sand and mud flats all along the Pumicestone Passage. It’s not a very big snail, only about 5cm across the shell. What is amazing is the enormous size of some of these egg masses. They can be up to 25cm in length, and you can see how fat they are! Pick one up – it’s perfectly safe – you’ll see tiny brown dots inside the “jelly”. 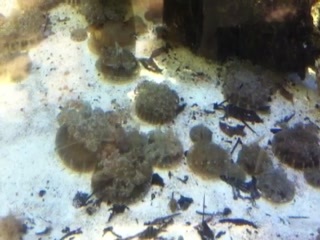 These are the eggs, thousands of them in each egg mass. Only a few days after they are laid, they hatch into little squiggly babies. How does something as small as a leaden sand snail lay something this big? Easy- it lays the eggs in a thin, gelatinous rope, which then swells up when it absorbs the seawater. Further along, there’s something else – again like a jellyfish, but perfectly round like a marble.. . Oh, watch out – is this one of those box-jellies or an irukandji??! It’s okay, don’t panic, you’ve just found a sea gooseberry! Not actually related to jellies, the sea gooseberry is completely safe, so you can gently pick it up for a proper look. Practically invisible in the ocean (or a bucket of water – try it), this marvellous little creature has rows of tiny hairs that move the sea gooseberry through the water. Something interesting is rolling around at the water’s edge. It’s squirting out bright purple ink. Not a terrifically pretty creature – it’s fat and blobby, with wings along each side. What on earth is this?? This is a Sowerby’s sea hare, a type of sea slug that loves to wander the ocean floor, grazing like a cow. Every now and again, lots of them will come ashore and get stranded on the falling tide. Our little mate, Henry, loves to “rescue” them. He scoops them up in a handful of sand and takes them back into the water. He’s careful not to touch, because some people get a mild rash from Sowerby’s sea hares. Usually, when one gets dropped back into the ocean, it lets out a great cloud of purple ink – fabulous fun, but be warned- don’t let any get in your eyes! Sometimes you might find a small shell on the beach, a little like a fragile pipi shape. This could well be the internal shell of the Sowerby’s sea hare – that’s right – they wear their shells on the inside. If you check out Youtube, there is a great video of a Sowerby’s sea hare, moseying around the Pumicestone Passage! Wandering along past the jetty, you can see some round things lying at the bottom, in the water below. Oh dear, look – lots of dead jelly-fish! Are they? …. really? … or are they the upside-down jelly? Yes, exactly – upside-down jellies, because that’s how they like to live. Upside-down jellies can swim like a regular jelly-fish but prefer to spend their lives sitting on the floor of sheltered places, with their legs in the air (water). This is because special algae live on the jelly’s tentacles, which need sunlight and photo-synthesis to make food, for the jelly. The upside-down jelly isn’t really dangerous but it is just as well not to touch it, because their tentacles can sometimes give a little sting and might cause a rash. Here’s something else you might see on the beach, and especially when swimming, which can give you a NASTY sting and leave you with a rash. They don’t turn up often at Bribie but when there is a blue-bottle on the beach or in the water, it’s always a good idea to know what you’re looking at. 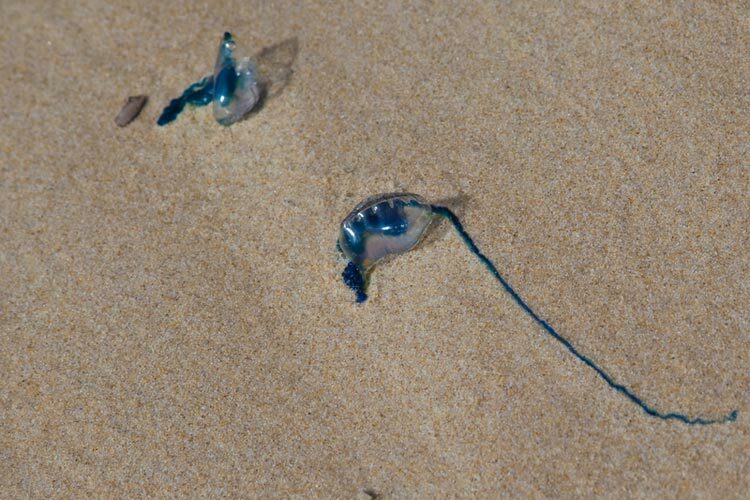 The blue-bottle is not one animal but actually a colony of four different types of animal, more like a household than a jelly-fish. There is the bladder-animal, there are tentacle-animals, a stomach-animal and a reproductive-animal. They all get along together and have a great time stinging us, if we’re not careful! If there is a north-easterly blowing at Woorim, keep a lookout for blue-bottles; check the Surf Lifesaving information board, which will generally tell you if there’s been a problem with blue-bottles. If you get stung by a blue-bottle, pull the tentacles off your skin, rinse your skin with salt water then apply hot water (45degrees) for about 20 minutes. NO cold water, NO ice, NO vinegar. Don’t worry, it won’t hurt forever, just take some time out and have another walk along the beach.